JM Sorrell, the spokesperson for NoHo Pride, provided answers for some of the questions below. TRT’s staff gathered other answers when responses were still needed/unclear. Q: What’s this year’s theme? Logo? Please send a copy of the artwork, if different from your own organization’s logo. Love Happens At Pride! (Reporter gathered the information from the organization’s website). Q: Who are/will be your grand and honorary marshals? Why were they chosen? A: We do not have grand marshals. Q: Send us a list of your events during Pride Week/Day, and explain why are they relevant in terms of your theme? What are you hoping to achieve at these events? A: The march/parade starts at 11 a.m. and ends at the Three County Fairgrounds where there are events all day (again, see nohopride.org). Q: How has the Stonewall Anniversary changed your preparation and scheduling of events this year? A: In fact, one such workshop will indeed focus on the Stonewall Uprising and the 50th anniversary. Did you also know that May 17, 2019, will mark 15 years of marriage equality in Massachusetts? Another big anniversary is that this marks 30 years since Governor Michael Dukakis enacted legislation for protections based on sexual orientation for public accommodations, employment, and housing. We were the second state in the country to have these protections at the time. Still today, over half of our states do not offer such protection, as you may know. Q: How are you being inclusive of PoC and QTPoC people when it comes to Pride this year? Please explain. A: Noho Pride has always been both inclusive and expansive, as the organizers listen to community members to meet the needs of participants. Q: When (date) will Noho Pride be this year? A: The date is always the first Saturday of May—this year—May 4th for the 38-year anniversary event! The after party is the place to be, too! It is at 7 p.m. at the Florence VFW. See the press release and website for more details. Q: What are events that are new to Noho Pride this year? Q: What are the prices to be a part of the Parade/become a vendor? Where can they be found? A: There is no fee for entrance or parking at the Fairgrounds. To offset increasing costs, we are charging a minimal fee for the for-profit contingents in the parade. Non-profits are free of charge. Q: If there are people who have felt unwelcome in the past, what do you say to them this year (if any)? A: I have been asked the question you pose over the years: “Does anyone feel unwelcome?” My answer is that all LGBTQ people and allies are always welcome. If someone feels there is something missing, I fully encourage joining the all-volunteer staff to get involved in the creation of the day each year. The volunteers work very hard to create a magical day for our region. Also, our vendors and sponsors offer the support we need to cover Fairground, permit, police and other costs. Linda J. DeMarco, Boston Pride’s president again, sent her replies to TRT as Boston Pride prepares for a large celebration this year due to their recognition of the 50th Anniversary of the Stonewall Riots. A: 2019 Boston Pride Theme: “Looking Back, Loving Forward” represents the recognition of the 50th anniversary of the Stonewall Riots and is meant to encourage the community to reflect back on the many challenges and incredible victories of the LGBTQ+ community in that time. A: The decisions on the theme and marshals were made through online voting by the community. The community voted Dale Mitchell, founder of the LGBT Aging Project, as Grand Marshal; Ava Glasscott, trans model and former Miss Trans USA Pageant contestant will serve as Marshal; and Honorary Marshals are the late Chris Harris, entertainment impresario and longtime supporter of the LGBTQ community, who passed away in January and the late Marsha P. Johnson, as the Champion Stonewall Honorary Marshal, who was a transgender activist and a veteran of the Stonewall Inn uprisings. Q: Send us a list of your events during Pride Week, and explain why are they relevant in terms of your theme? What are you hoping to achieve at these events? A: This year, Boston Pride Week begins on Friday, May 31 with the Pride flag raising at City Hall Plaza and our signature events include Pride Day @Faneuil Hall on Saturday, June 1, Pride Community Forum on the 50th anniversary of Stonewall Inn uprising on Monday, June 3 at historic Faneuil Hall, the annual Pride Parade and festival on Saturday, June 8, Pride Block Parties in the Back Bay and Jamaica Plain on Sunday, June 9 and Pride Night @Fenway Park on Tuesday, June 11. A: Boston Pride created a separate committee to work on events and programming for the 50th anniversary of the Stonewall Uprising, a defining moment in the history of the LGBTQ civil rights movement. Boston Pride plans to raise awareness of this anniversary through exhibitions, public discussions, and other events, acting in collaboration with local community-based organizations. It is important that, throughout Greater Boston, community people observe this milestone in our progress toward full equality. In addition to the Community Forum on Stonewall at Faneuil Hall, there are events throughout the month of June to commemorate this historic event. Information is on Boston Pride’s website at https://bit.ly/2uFAg1O. Q: How are you being inclusive of PoC and QTPoC people when it comes to Pride this year? A: Boston Pride is an inclusive organization and welcomes all to participate throughout the year and during Pride Week. We create safe spaces for the LGBTQ, PoC and QTPoC communities to celebrate, commemorate and be who they are. Q: When (date) will Boston Pride be this year? Q: What are events that are new to BP this year? Q: What are the prices to be a part of the Parade or where can they be found? To be a vendor? A: Info regarding registering for the parade, for the festival and pricing can be found on the Boston Pride website: www.bostonpride.org. We have reduced fees for smaller nonprofit organizations. Q: What do you say to those who have felt unwelcome or left out your events in the past? What message would you like to send them this year (if any)? A: All in the community are welcome to participate in Boston Pride and we invite everyone to have their voices heard by joining our all-volunteer organization to make Pride Week 2019 the best ever. In 2020, it will be the 50th anniversary for Boston Pride and we are looking forward to commemorating that milestone with events, programming, and celebrations for all in the LGBTQ community. Priscilla Acosta, Pride Portland’s! Marketing Chair answered the questions for TRT. However, Pride Portland! is still in the midst of planning the parade and festival this year. Acosta explained that this was the reason why she didn’t “have an answer for all of the questions asked” at this time. Q: What’s this year’s theme? A: This year’s theme is Stonewall 50. A: Without the Stonewall riots and the subsequent marches that came after, modern day pride parades would not exist. We keep that in mind every year when planning. This year, we want to make sure people in the community know the history and how far we still have to go. A: We’ve been holding community meetings in order to get input from the community. We started with a community-wide one and have plans for meeting with different affinity groups, starting with QTPoC (which is March 25). Our steering committee also consists of 3 PoC (me included!). We know and value the importance of having spaces just for QTPoC. 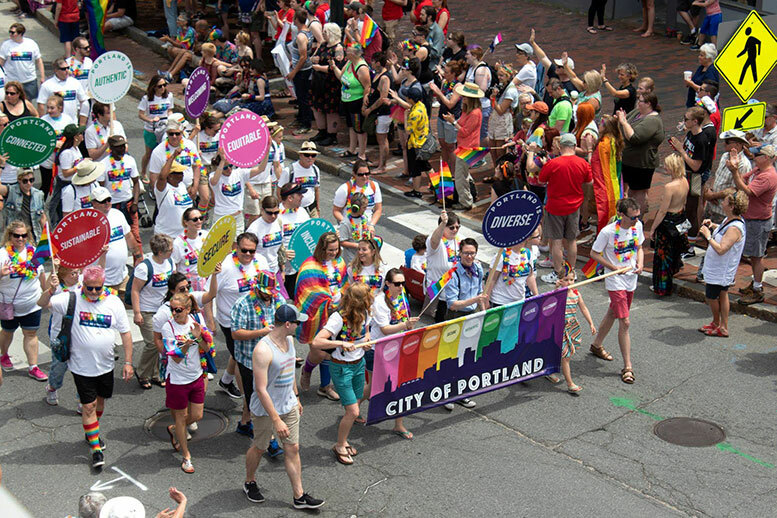 Q: When (date) will Pride Portland! be this year? A: The parade and festival will be on June 15th but we have 10 days of Pride events from June 7th to June 16th. Q: What are the prices to be a part of the Parade/become a vendor & where can they be found? A: Parade and festival are free to attend if you just want to show up and have fun. If you want to be IN the parade, price depends on the size of the group, if it’s a business, whether you’re walking or have a vehicle/float, and whether you’re a merchant or not, and more. You can see exact prices when registering https://prideportland.org/register. A: We are making a genuine effort to make sure everyone feels included and feels like Pride is for them. We’re always open to feedback and we can always use more volunteers. The Pride parade and festival isn’t owned by Pride Portland!, it’s for the community, by the community. I think it’s important to note that Pride Portland! is completely volunteer-run. We’re working hard to plan everything so our community has a place to gather, celebrate, protest, be themselves, etc. North Shore Pride Board Member Betsy McGinnity, answered the questions for the organization this year. A: We are honoring the Stonewall Riot Survivors this year and as such Salem resident Denis Castleton will be North Shore Pride’s Grand Marshall. Q: Send us a list of your events during Pride Weekend, and explain why are they relevant in terms of your theme? What are you hoping to achieve at these events? A: It influenced our theme. Our speaker at the Interfaith is John-Manuel Andriote author of several books including Stonewall Strong: Gay Men’s Heroic Fight for Resilience. A: North Shore Pride is always inclusive of PoC and QTPoC as our motto for North Shore Pride has always been “Unity in Our Community”. We invite PoC and QTPoC to participate on the Board of NS Pride and to offer new events and programming ideas for us to provide [to the public]. Q: When (date) will NSP be this year? Q: What are events that are new to NSP this year? Q: What are the prices (if any) to be a part of the Parade or where can they be found? To be a vendor? A: All are welcome at North Shore Pride. Michele Roy Brown, Worcester Pride’s Secretary, provided the responses for the Central Mass. Pride organization. Many events that Worcester Pride will hold (their origin) are rooted in the Stonewall Riots’ celebration, according to Roy Brown. A: This year’s theme is “Make Your Own History” to tie in with the 50th year remembrance of the Stonewall riots and the people that fought and continue to fight for equality for all. Please see the 2019 logo attached. A: The parade marshals have not been chosen yet. We start to ask the community for ideas soon and marshals will be nominated in the summer. A: Due to the different time frame for our pride week events (September instead of June), we are still in the process of fine tuning and planning our pride week events. We always have an annual flag raising at Worcester city hall, a rainbow painting of the crosswalk downtown, a bridge lighting on Lake Quinsigamond, an LGBTQIA+ pageant, and the parade and festival. However, if you have any ideas for events that you would like to see, please let us know. We are always looking to make our events bigger, better, and more inclusive. We always hope to achieve visibility and inclusion at all of our events. A: The Stonewall Anniversary has really inspired a lot of cool things to happen in Worcester. The Worcester Historical Museum is putting together an amazing LGBTQIA+ exhibit titled “LGBTQ for the Record” that will feature different aspects of the gay history of Worcester and beyond. The exhibit will open on April 25th and run through September. Additionally, Worcester Pride added “Stonewall 50” to their logo to commemorate the anniversary, and several other things are in the works as well. Our third annual youth pride prom is on May 11th at the YWCA from 6-10 and the theme is “The Future is Queer” to also tie in with the Worcester Pride theme and Stonewall Anniversary. A: Yes, last year, one of our committee members, Brianna Brewer, started a QPoC group called “Shades.” The group meets on the 2nd and 4th Monday of every month at 6 p.m. at Pathways for Change. They are working on several different events throughout the year and for pride week. Q: When (date) will Worcester Pride be this year? Q: What are events that are new to Worcester Pride this year? A: We are working on some new events for 2019, as we do every year, but nothing is set in stone as of yet. A: Parade and vendor registration can be found on the main page of our website www.worcesterpride.org. The pricing is below, but please email us with any questions [email protected]. A: We work very hard to make sure that everyone feels welcome to join our events, our committee, and beyond. If anyone is interested in learning more about our organization, they can visit our website at www.worcesterpride.org. We welcome all kinds of feedback and would like to work with people if they have ideas on how to be more inclusive if anyone does not feel included for any reason. Q: Is there anything you’d to add? A: We are really excited for the 2019-year of Worcester Pride. There are so many cool things going on in the city as it continues to evolve, and we look forward to being part of that. If anyone would like more information on this year’s events, how to be more involved, or to share any ideas that they have, please email us at [email protected] or visit our website www.worcesterpride.org. *The upcoming May 2019, issue of The Rainbow Times will have Part II of this series and more Pride Celebrations and events that will be taking place from the various Pride organizations highlighted via this series. Be the first to comment on "Pride Events in New England Part I: Celebrating 50 Years Post Stonewall"